Let us make your special day come true. 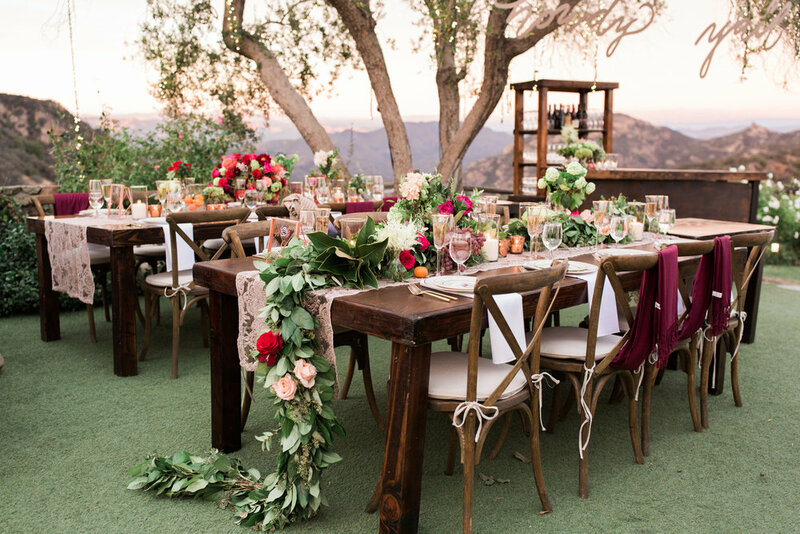 Picture your wedding ceremony and reception encircled by the spectacular natural beauty of the Santa Monica Mountains among 1,000 acres of rolling hills lined with vineyards, manicured lawns, ancient oaks, rose gardens, ribbons of white fences and horses grazing in the background. 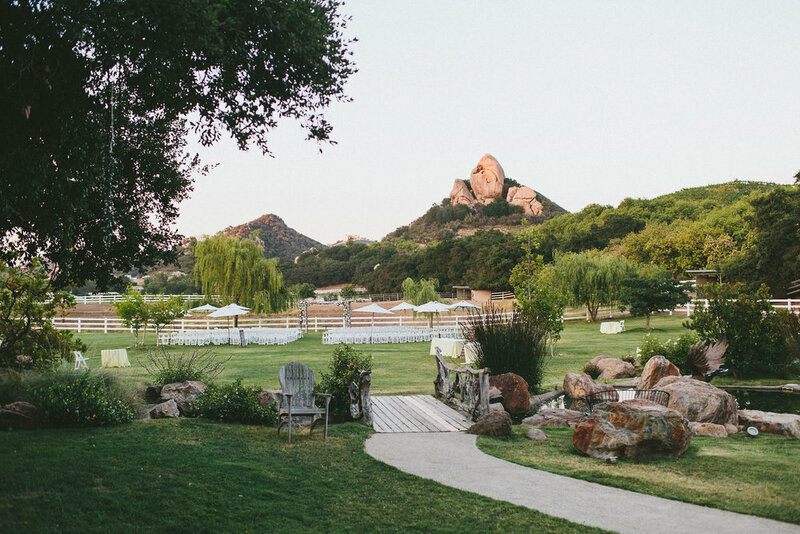 With its natural beauty and secluded rustic charm, it's no wonder Saddlerock Ranch has become a popular weekend setting for special occasions — including magnificent celebrity weddings for stars like Kelsey Grammar, Lisa Kudrow, Don Henley and many more. It's a picture-perfect environment for exchanging vows or to host an unforgettable event. We have five unique and private locations available to rent for a 24-hour period and a list of preferred vendors who have worked here for many years that we would love to share with you. 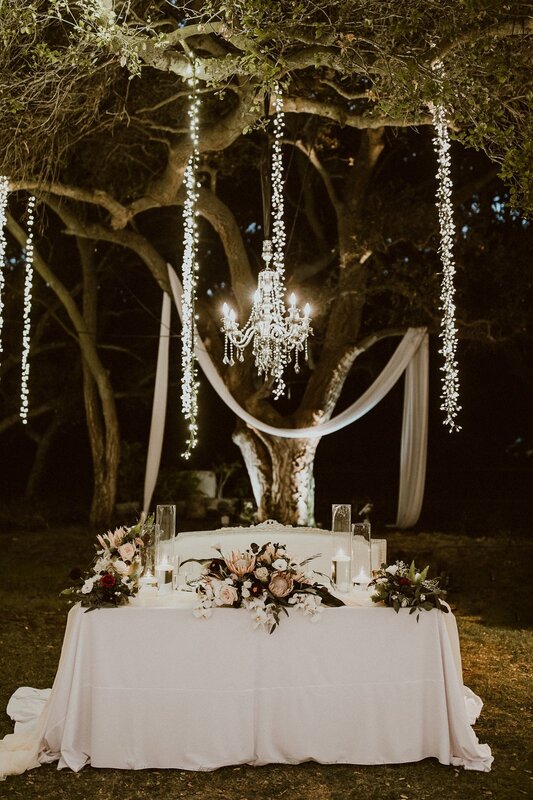 The Garden setting features rolling hills lined with vineyards, manicured lawns, ancient oak trees, rose gardens, white fences, exotic animals and hanging twinkle lights in the trees, which all create the perfect backdrop for your special occasion. Vows are exchanged in front of olive trees under a fallen oak tree arch entwined with grape vines. From an intimate gathering to a grand celebration with all of your family and friends, this location can hold anywhere from 100 to 500 guests! Your guests will enter through a scenic driveway surrounded by ancient oaks and get a glimpse of endless rolling hills and valleys off in the distance. The possibilities for a ceremony and reception are endless here with our custom rock waterfall, and guests will have views of our Estate grown wines, lake, Turtlerock, and horses grazing in the distance while encircled by majestic hanging twinkle lights. This space is the perfect place to get creative and build - from tents to hot air balloons and even large scale stages and performance areas, a complete blank canvas to illustrate your story! This location can accommodate up to 450 guests. The Vineyard setting is located on a hilltop situated in the middle of the vineyards surrounded by white rose bushes. From this elevated vantage, you have 360 degree panoramic views of the surrounding vineyards and valleys. In keeping with the natural setting, vows are exchanged under a fallen oak tree arch, entwined with grape vines. 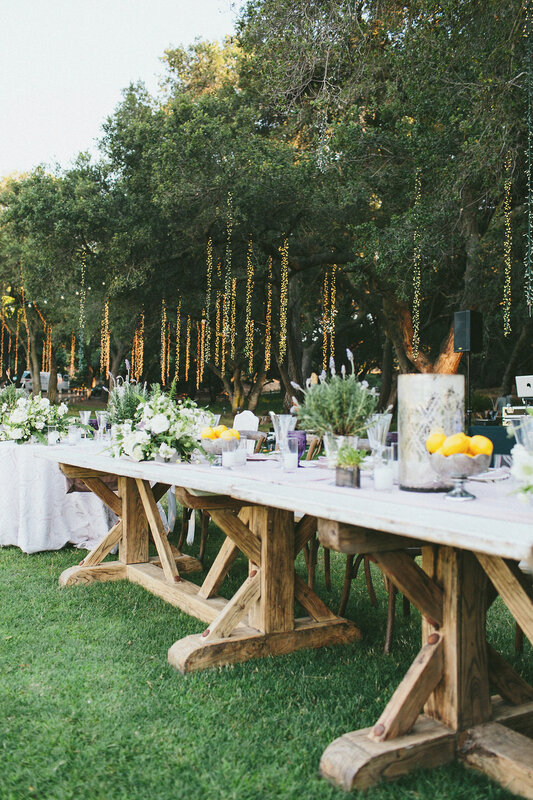 Hanging lights from the trees create the perfect ambiance for a reception. This location can accommodate up to 140 guests. For a unique, vintage experience our Camp Cabernet setting features seven chicly remodeled and furnished Airstreams, Dalton, Spartan and Shasta trailers, along with vintage cars and a taxi cab, dotting a scenic vineyard-view, creating an intimate yet relaxed atmosphere. This space is perfect for a memorable event and to celebrate everything from your wrap party or corporate event, to a wedding. Watch the sun dip below the mountainside with your family and friends in this one-of-a-kind location as you exchange vows under a round archway with incredible views of rock formations and vineyards. This location can accommodate up to 300 guests.